My experience of tofu was of some 30 years ago. Although in not being able to remember exactly, I do know it was not good. Mushy and boring may have been two words that described it. We have been practicing Fish Friday and Meatless Monday. That Meatless Monday was a challenge, until I learned more about tofu. Soy is an excellent source of dietary fiber and protein. It is rich in vitamin B6- important in building amino acids and in the formation of neurotransmitters. 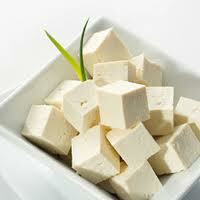 Furthermore, soy is often recommended as an alternative for meat in low-fat diets. But soy’s greatest advantage may lie in it being a rich source of isoflavones – plant hormones that have been linked to several health benefits; cardiovascular protection, smooth sailing through menopause, antioxidant protection. Cook the brown rice to the directions on you favorite brand. You can leave it until later or refrigerate for the next day. Same with the veggies. If time is a crunch, cook them up then put them in the fridge for later. Cut up tofu into chunks/squares. With your oil of choice and as much garlic as you like, saute the tofu; flipping and turning until lightly browned. The time this took surprised me. Tofu is not an instant food. Allow a good 20 min. IF you need to cook your veggies; scoop out and set aside the tofu. Once the veggies are tender add the tofu back in and gently stir in your rice, just to combine. NOW we’re going to make the sauce. For those that are use to cooking with specific measurements, step out of your comfort zone. The general guidelines are; the same amount of soya sauce and honey/agave and the juice of a whole lime. Add them all to a small bowl and mix. Taste. A little more or this or that, customize it for your particular tastes. Add it to the skillet with rice, tofu and veggies and just warm up while mixing gently. I avoid all “reduced” products. They have been manufactured more. If your not eating a lot of processed and salty foods, the regular soya sauce will be fine. This makes a full meal for four with plenty to be reheated (either on stove top or those that still use it, in a microwave).